Unlike previous years when U.S. retailers have begun to push Christmas on me at the end of October, external reminders didn’t really start here until December. Maybe that’s because I’m living on a farm and don’t spend much time in stores; no doubt the fact that I don’t watch any TV or listen to the radio also plays a role. Anyway, Christmas is almost upon me and I’m in a holiday mood. Svanholm held a Christmas market on the first Sunday in December. External vendors sold crafts, while Svanholm sold various things to eat, vegetables to take home, and horse-drawn cart rides. As you can see below, we got a dusting of snow that morning, which made the atmosphere very Christmasy, but may have kept some customers away. About 800 people visited over the course of the day, fewer than the typical year’s 1000. Bryn came and helped me make cream puff swans that were a hit with both visiting customers and the Svanholmers (Svanholm means “swan island”). Chika, a Japanese guest who was here over the summer and fall, taught me how to make these tasty treats. You can see for yourself how cute they are. The following weekend, I joined my neighbors Signe and Tom for a performance of Handel’s Messiah at Christian’s Church in the Christainshavn district of Copenhagen. The three hour performance was magnificent and I was intrigued by the unique theater-style architecture of the church. A common tradition here in Denmark that is not practiced much in the U.S., is the “julefrokost” or Christmas lunch. On the 14th I attended one for Svanholmers who work on the farm and there will be another, general one on the 26th. The first lunch was hosted by the Building Group and it was remarkable how cozy they could make the workshop feel. A snowstorm earlier in the week made the Christmas aura even brighter. The amount of food served at the lunch was ridiculous: fish, chicken, beef, and pork. Beverages included champagne, akvavit, whiskey and beer and the program included songs and various games. We started the festivities at 2pm; I lasted until about 9pm, while others partied well into the morning. I might have been tempted to stay longer, but I had to get up early the next morning to catch a flight to Stockholm, Sweden. A Danish friend who worked in the kitchen this last summer invited me to join her there for a few days. Lise will stay in a friend’s Stockholm flat into the New Year and I was very happy to take the opportunity to see her again and discover the city. Stockholm is a beautiful place, built on 14 islands and connected by picturesque bridges, with water and views everywhere. Stockholm lies northeast of Copenhagen at about the same latitude as Churchill, Canada, where many tourists go to see polar bears. The outside temperature wasn’t so bad; it hovered at just about freezing while I was there, but the shortness of the days was remarkable. By about 1:30 pm dusk was approaching and by 3 pm it was completely dark! I want to return to the city some day when there is no snow and enough daylight that I can really see it. I also enjoyed the gingerbread houses on display at the Architecture Museum. The same museum included “Homemade Recipes for Urban Activism”. Unlike Macy’s in downtown Saint Paul, Stockholm’s largest department store, NK (Nordiska Kompaniet), stills mounts animated Christmas displays in its store windows, charming children and adults alike. This year’s windows were based on popular children’s stories, including Pippi Longstocking, as you can see below. Stockholm’s City Hall is the site of the annual Nobel banquet and ball. After dinner is served in the “Blue Hall”, guests are ushered upstairs to the “Gold Hall” for dancing. The Gold Hall contains 10 kilograms of gold in the 18 MILLION glass tiles that make up the mosaics which cover the walls. The artist Einar Forseth estimated he needed seven years to complete the mosaics, but the architect Ragnar Östberg only gave him two years. Incredible. I want to share two more images from Stockholm, both of which made me smile. The first is of a statue outside the Central Station that someone decided needed headphones and the second is from a food hall in Östermalm. I got back to Svanholm on Thursday, the 20th, connecting with Bryn in Copenhagen on my way. She had just finished her big semester project on industrial symbiosis and was ready to relax. It was a priority for both of us to be at Svanholm for the “solhverv” (solstice) celebration, having heard about it from my niece Leah and many community members. While a lot of Scandinavians celebrate the summer solstice with bonfires, not many still mark the winter one. Svanholm’s solhverv traditions are special. We gathered outside the dining hall at 3pm and started walking together through the woods. Our first destination was a nearby hill, where we enjoyed a bonfire, songs and rum in the gathering dusk. By the time we walked to the second hill, it was dark and getting chilly. We were welcomed by another, bigger bonfire and partook in cookies, clementines, songs, and gløgg (warm spiced red wine). After much singing and socializing, we lit home-made torches and began our journey back through the woods. When we got to the road, we were really a sight for cars that passed by. It was so magical. The closest experience I can compare it to is the luminaries on Lake of the Isles. Darkness, fire, and cold. When we got back to the park behind the manor house, we used our torches to light a bonfire that burned all night in order to welcome the sun back as the days start to get longer again. We sang another song or two and then went to the dining hall for a bowl of delicious yellow pea soup and medister pølse (a special spicy pork sausage served around Christmas time). And now it’s the 23rd and I’m in Copenhagen. Bryn and I volunteered today at the socio-anarchist community of Christiania and will go there again tomorrow to help with the Christmas dinner. 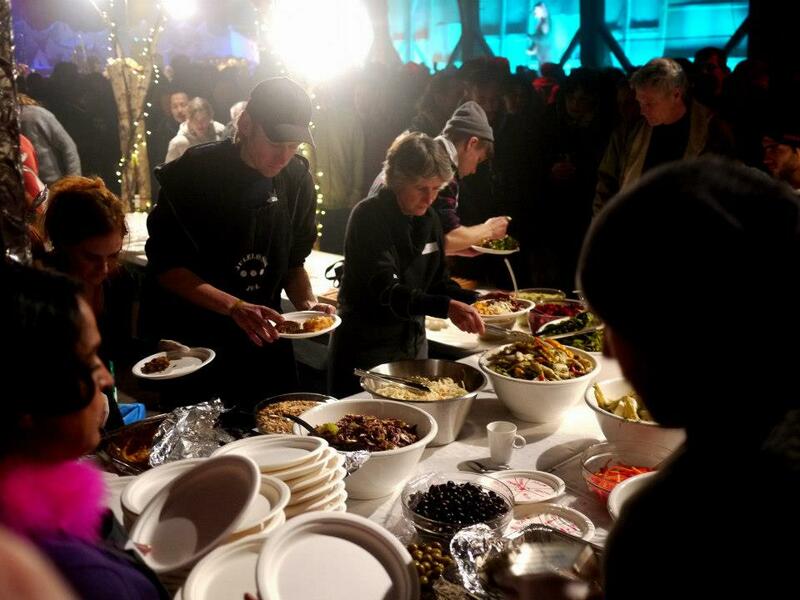 For the past 25 years, Christiania has hosted a free Christmas dinner for the homeless and for others who happen to be alone over the holidays. I’m told that last year they had 4000 attendees (less than half were homeless). 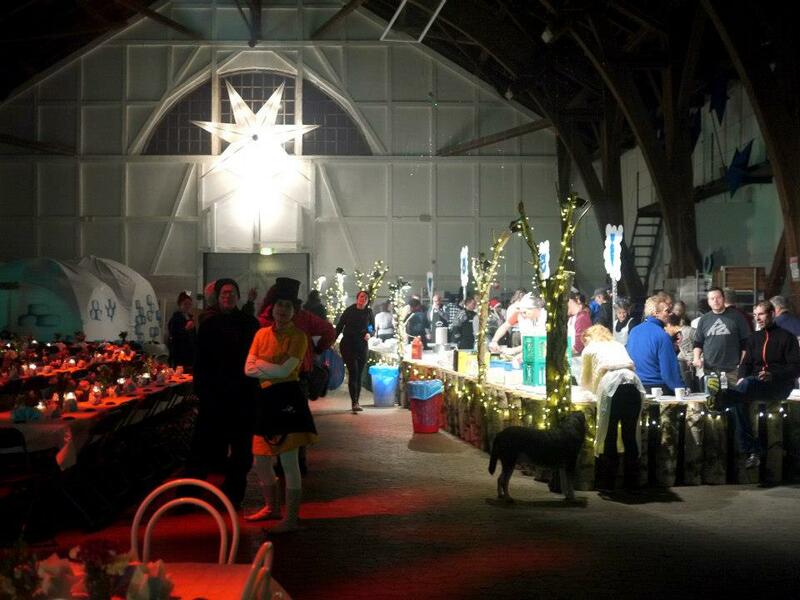 The food is all donated (Svanholm gave the potatoes this year), as are the decorations and entertainment. 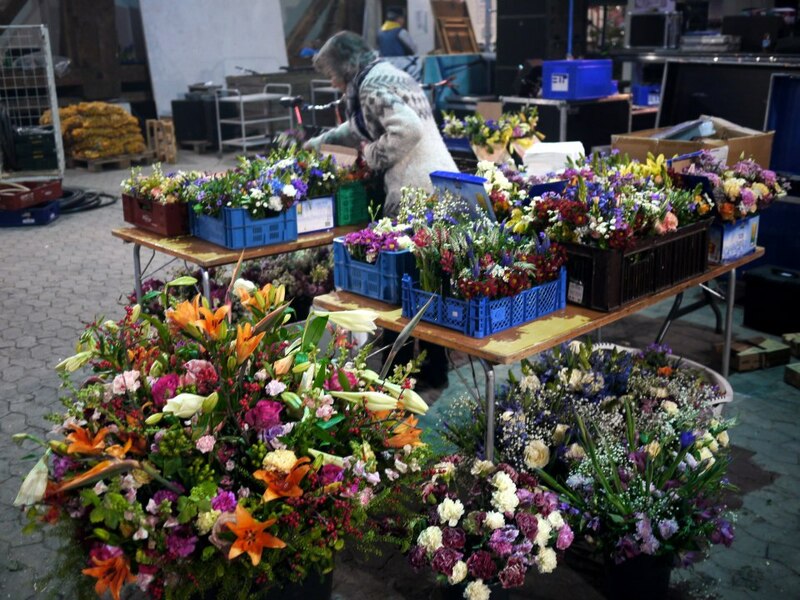 While a snow storm raged outside today, I had the pleasure of working with flowers: first making centerpieces for the tables and later helping to make a wall of flowers that will greet guests as they enter the Great Hall. I would include photos, but they are all on Bryn’s camera and she stayed on to volunteer later than I did tonight. I think I’ll go ahead and publish this post now and add a couple of photos in a week or so. By the way, my American friends might be interested to know that the Danes celebrate three days of Christmas, the 24th, 25th, and 26th, and two days for New Year’s, the 31st and 1st, which makes for very few work days at the end of the year. A year later and I’m finally adding a few photos from Christiania. Better late than never, right? First, the beautiful flowers. The sight and smell of them in the dead of winter was heavenly. Shown below, the evening of December 24th, just before the doors opened to the public. Earlier in the day, we witnessed the construction of the large star on the far wall and the cutting of the logs that decorated the serving tables. I worked the vegetarian plate line. Vegetarians received about 6 or 7 different amazing veggie dishes arranged on their plate. The meat eaters went elsewhere to get traditional Danish roast pork, red cabbage and potatoes. Later there were mountains of cookies and chocolates. No one left hungry. Happy Holidays to you and Bryn…this was a delight to read. So glad you are having an adventure! What a storybook experience you are having! Thanks for sharing it in so much detail. Things are toodling along here. The depot is finished and open for business, at least for buses. The waiting room looks great except for the furniture, which looks cheap and tacky (to me anyway). I would have preferred oak benches to keep with the historic look. One boon is that they are now keeping the skyway open to the head house until 2 AM. Can’t wait for the light rail to be ready. Construction seems nearly done – almost all streets and sidewalks are open now. I hear they’ll be doing test runs of trains in 2013. Nancy, Griffin, John, and baby Benjamin were over last night. They’re doing well. John has a new job he really likes. Griffin has new cowboy boots (and jeans and shirt). He’s in the Spanish immersion school now. Did you hear that Gretchen and David Fellon bought a house? They won’t be moving until spring or summer, as there’s a lot of work to do on it. It sounds pretty fabulous. It’s on Grand Hill and was formerly owned by Weyerhausers. Steve and I continue our holiday tradition of working jigsaw puzzles. For Thanksgiving we built a 3-D Eiffel Tower. We’re now working on a 4-D map of Paris (they provide a timeline for you to follow when adding the buildings, adding the 4th dimension). We won’t be traveling anywhere this winter, as Magen (Steve’s dog) is expecting puppies about January 5. You would not believe the amount of money and kind of vet care these pure-bred dogs get. And when the puppies come, they’ll have round-the-clock human attendants (pas moi). They’re wonderful dogs, but come on! Cats can deal with these things on their own – what instincts have they bred out of the poor doggies? I’m glad you’re having such a wonderful year. You inspire us all. We’ll try to keep the home fire burning as we await your return (and further stories). How neat to experience the different holiday traditions! The solstice tradition is really cool. I love knowing that we’ve finally reached the shortest day of the year and the days are going to get longer at last. That is so neat to get to experience all of the new holiday traditions! 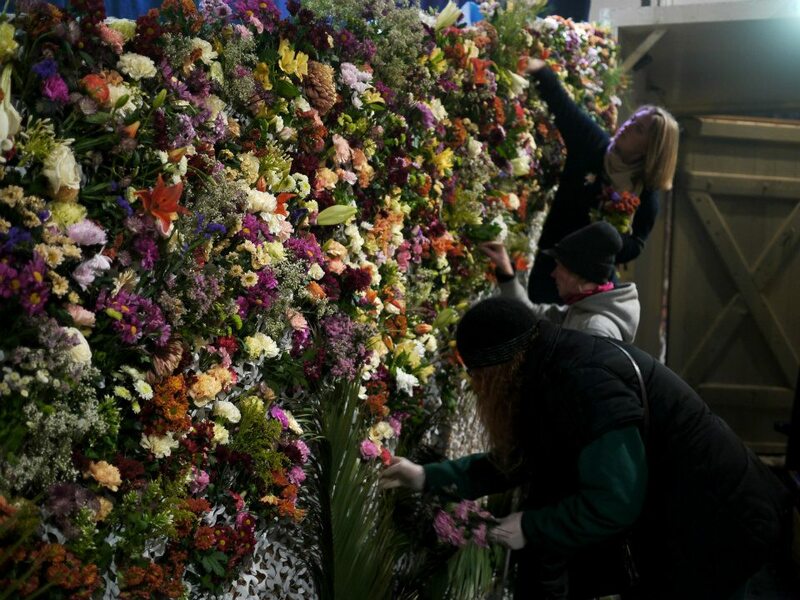 And a neat way to celebrate the winter solstice. I always enjoy knowing that the days are going to finally start getting longer again. P.S. Say ‘hi’ to Bryn! It was a year ago that she was helping paint work! How fun…thanks for taking the time to invite us in to a magical season. It’s New Years morning here. Temps have hit -4. All the kids and grandkids are safely back in their own homes after a week here. So I am relishing a day to stay bundled up inside…even putting Christmas away for another year. Barb, Peggy and I managed to continue a holiday tradition of having lunch at the River Room. (Sean didn’t make it…we need you back to enforce his sanity :).